Stewardship Reflection on Lectionary Readings: August 19, 2018 - Catholic Stewardship Consultants, Inc.
Jesus said to the crowd, “Whoever eats my flesh and drinks my blood has eternal life, and I will raise him on the last day.” Their response? Shock and indignation. We can hardly blame them for this reaction — eating the Flesh and drinking the Blood of our Lord should cause us a bit of a shock. Yet, how easy it is for us modern-day Catholics to show up at Mass Sunday after Sunday, receiving the Eucharist as simply part of a weekly routine. If we really spent time praying and contemplating the gift our Lord is offering us in this sacrament, we would be awestruck at the love and power in this gift. Through it, our Lord is giving us the very best He has to give — Himself. 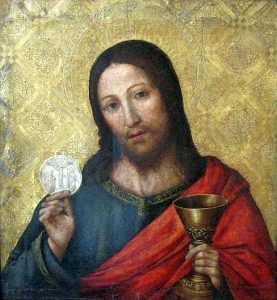 In his gift of the Eucharist, He has held back nothing, giving us literally everything he has to give, His very Body, Blood, Soul and Divinity. Not even the greatest theological scholar or the holiest of saints can fully understand this mystery. St. Paul delivers a similar message in our second reading, instructing, “Watch carefully how you live, not as foolish persons but as wise, making the most of the opportunity because the days are evil.” So, we don’t need to be saints or scholars in order to receive this sublime gift. But we should do our best to receive the Eucharist with gratitude. And we can look to today’s readings to glean two fundamental principles to become better Christian stewards. First, the Eucharist is the foundation for a stewardship way of life. Through His gift of the Eucharist, God fills us with His love and strength. This love and strength empower us to live as generous stewards — to be faithful to the ministries in which we serve, to step beyond our comfort zone in material giving, and to offer our very best to our families and secular work. Second, the Eucharist is our ultimate inspiration for a stewardship way of life. When we really think about what we receive in this gift — God Himself — we will want to make a joyful return to Him by the way we live our lives! The more that we deepen our understanding of this sacrament through study of the Church’s teachings on the Eucharist, the more we will want to live our lives as grateful, generous and joy-filled stewards. As the book of Proverbs and the great St. Paul remind us, let us not live foolishly, but make the most of our time — during Mass and adoration — by giving the Lord all our attention and devotion in these moments. Let us form ourselves by studying what the Catechismand spiritual writers have to teach us about the Eucharist. Then, coming to Mass each week will be anything but routine. And in return for this unfathomable gift of our Lord Himself, let us live intentionally and passionately as His disciples every day of our lives.